Aquaculture, the farming of aquatic animals and plants, and other seafood businesses continue to grow rapidly around the world. However, many of these businesses fail due to the lack of sufficient attention to marketing. The Seafood and Aquaculture Marketing Handbook provides the reader with a comprehensive, yet user-friendly presentation of key concepts and tools necessary for aquaculture and seafood businesses to evaluate and adapt to changing market conditions. Markets for aquaculture and seafood products are diverse, dynamic, and complex. 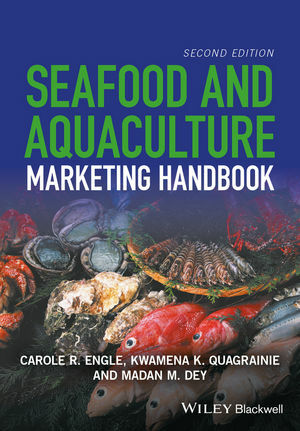 The Seafood and Aquaculture Marketing Handbook presents fundamental principles of marketing, specific discussion of aquaculture and seafood market channels and supply chains from around the world, and builds towards a step-by-step approach to strategic market planning for successful aquaculture and seafood businesses. This book is an essential reference for all aquaculture and seafood businesses as well as students of aquaculture. The volume contains a series of synopses of specific markets, an extensive annotated bibliography, and webliography for additional sources of information. Written by authors with vast experience in international marketing of aquaculture and seafood products, this volume is a valuable source of guidance for those seeking to identify profitable markets for their aquaculture and seafood products.